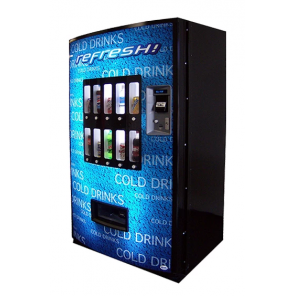 With the ROYAL 650 Drink Machine you can vend 10 differently priced items ranging from 12oz cans to 24oz bottles. This company is one of 3 manufacturers certified to be used by Coke, Pepsi and Dr. Pepper. Great for medium to larger locations. The Royal 650 vending machine designs are the result of building more than one million vendors for the soft drink industry over the last twenty five years. 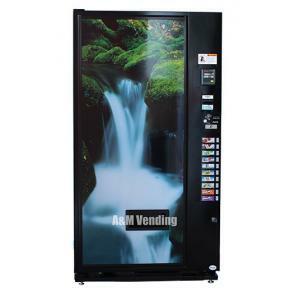 The Royal 650 Merlin IV line provides the customer with many features, including superior soft drink package flexibility, Energy Star Tier 3 compliance, a vandal resistant cabinet, and electronic refrigeration controls. Since April 2004, most Royal Vendors equipment manufactured for use in the United States and Canada is Energy Star qualified. 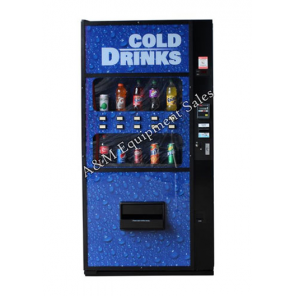 The Royal 650 Drink Machine has 10 selections with 12 columns enabling you to double up on two good sellers. The Royal 650 has a 24 volt direct drive delivery system eliminating micro switches. Capacities: 648 – 12oz. cans, 288 – 20oz. bottles. We can customize this machine to vend most items. Our staff will be happy to help you. Telephone technical support available Monday – Friday 8:00am – 5:00pm EST. Any questions don’t hesitate to contact us.